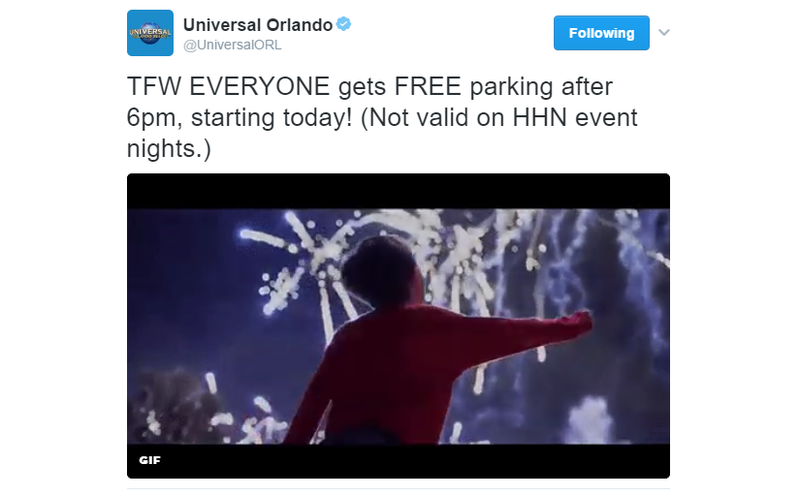 Universal Orlando Parking Now Free for All Guests After 6 p.m.
Are you among the Guests who aren't Florida Residents (or that have an annual pass that does not include parking) but that enjoy visiting Universal Orlando's theme parks and the adjacent CityWalk entertainment district after the sun goes down? Then you will be happy to know that, beginning from today, all Guests will be able to park for free at either of Universal Orlando's two parking garages every evening after 6 p.m. to enjoy all of the amazing nighttime offerings that are available around the resort. Of course, some people might think that this is not that big of a deal. After all, Annual Passholders and Florida Residents already get free parking, and those who don't fall in either category usually arrive to the Universal Orlando Resort earlier in the day anyway. Additionally, the theme parks close at 7 or 8 p.m. on most nights. All of that is true, but it's important to take into consideration that not all annual passes include parking, and the parks will remain open until 10 p.m. all summer long. This means that Guests who have the lower-tier passes can still enjoy the parks for a few hours without having to pay for parking. Additionally, Universal's Volcano Bay will soon open, and it will also have extended operating hours starting in May. If Volcano Bay's annual pass will not include parking, this could be a nice perk for those who just want to spend a couple of hours at the park. The only caveat is that parking will NOT be free when hard-ticket events are scheduled to take place. SCREENSHOT: © 2017 Twitter/Universal Orlando Resort. All Rights Reserved. Not generally advertised, but during the last few hours Disney parks are open, they shut down the parking booths and you can drive in and park for free. Times differ depending on how late the parks are open on a given night. stupid question. anyone know why universal doesnt stay open later? Is it due to it being in the city? Or the popularity of the parks? I for one love universal and usually miss out on a few offering as a result of the park schedules.